SIAL (Salon International de L’alimentation – or the Global Food Marketplace) is the largest international trade event for the food processing industry in the world. 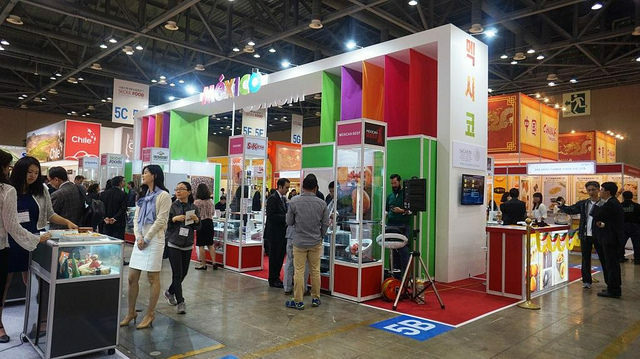 This year over 6,000 companies from 105 countries will be exhibiting at SIAL and UPB Products will be at SIAL showcasing its Cafe Asia range. We caught up with UPB director, Amit Bhavsar to talk all things SIAL Paris 2014. How many times have you attended SIAL? We have attended SIAL once before – in 2008. The product range was very different then, plus this year we are launching our new Cafe Asia range at SIAL which is very exciting. In effect I feel we are going to Paris with new and bold plumage – with a much stronger and wider range of lines and a very clear message of who we are, what we do and what makes us an attractive proposition to European retailer and food service companies. What aspect of SIAL do you enjoy the most – networking, talks etc? I have always enjoyed trade shows – there is so much to absorb, study and find inspiration in. Showcasing my business and our range and capabilities is really exciting. It’s also fun to meet so many people from across many different market sectors and geographical locations. Trade shows have made me realise the food industry and not such a big place. Who have you met or heard speak at SIAL that you found interesting and/or inspiring? You meet so many different people and everyone has an interesting story. At the end of the day my passion is food and I love meeting people with the same interest. The food industry is an incredibly dynamic and diverse place and SIAL is a great place to get inspiration and ideas – whether that be new packaging formats, new ingredients, new emerging cuisines… it’s an assault on the senses. Have you gained many new customers via SIAL? We gained some important European food service clients in 2008 who we still supply. But having said that Europe is a key growth market for us and as an established Ethnic / Asian manufacturer in the UK, export really is key to our expansion plans. I am hoping for, and expecting a successful show. Are you launching any new products at SIAL this year? We are launching quite a few new lines at SIAL – our new pre-cooked Sheekh Kebabs, our new range of cutlets and our new range of wraps. The new lines all follow a clear decision by UPB and our NPD team to concentrate on products that are innovative, convenient to prepare and offer a real authentic Asian flavours with all natural ingredients. How do you consider attending SIAL to be beneficial to your company? It allows us to showcase our range to a wide and influential audience that we may not meet normally. Also meeting people face to face is invaluable to creating a lasting business relationship. Emails and telephone calls cannot match the significance and insight that can be gained in a five minute conversation. It’s important for UPB to engage with our audience and SIAL gives us the perfect platform to do this. What was the most memorable thing to happen to you at a SIAL event? My lasting memory of Paris 2008 was the intense cold and rain! The days are long and tiring but it’s an incredible experience for me and my team as we learn a lot about ourselves and our company in the process. Make sure you say hi to Amit on the UPB Products stall at SIAL from October 19-23. For more information on all the SIAL events, hop over to their website. And why not come and connect with us on Twitter. Image by Alianza Pacifico, via Flickr. Creative Commons license 2.0.